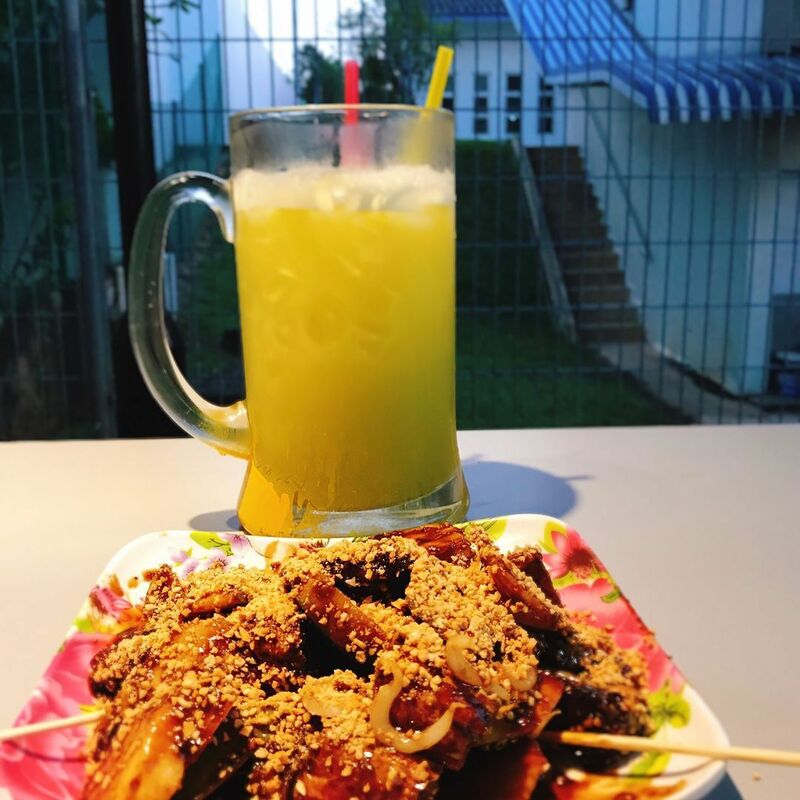 For me, growing up and living near Serangoon Gardens meant easy access to one of Singapore’s most popular late-night eating hot spots, Chomp Chomp Food Centre. 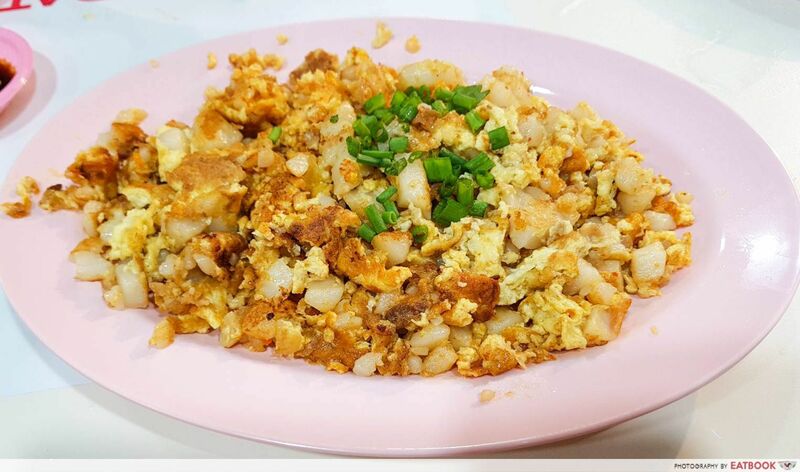 Locals and foreigners alike know Chomp Chomp Food Centre is the one-stop hawker place to get a fill of all your favourite local delights. However, lately, it has come to my attention that many are unsure of which stall to choose to truly get a taste of the crème de la crop, especially after the food centre reopened after renovations early last year. Well, it’s your lucky day, for I shall play host to you and guide you to the best of the best! There’s no way I would have started my list without one of the reigning kings of all local delights — fried prawn noodles! 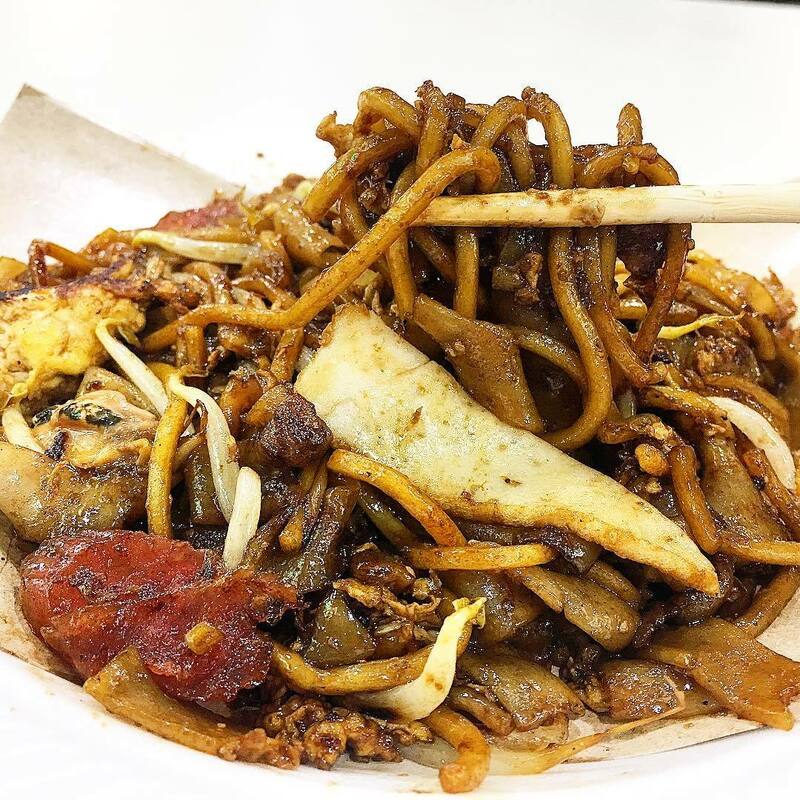 Ah Hock Fried Hokkien Noodles is probably the most well-loved hawker stall in Chomp Chomp. 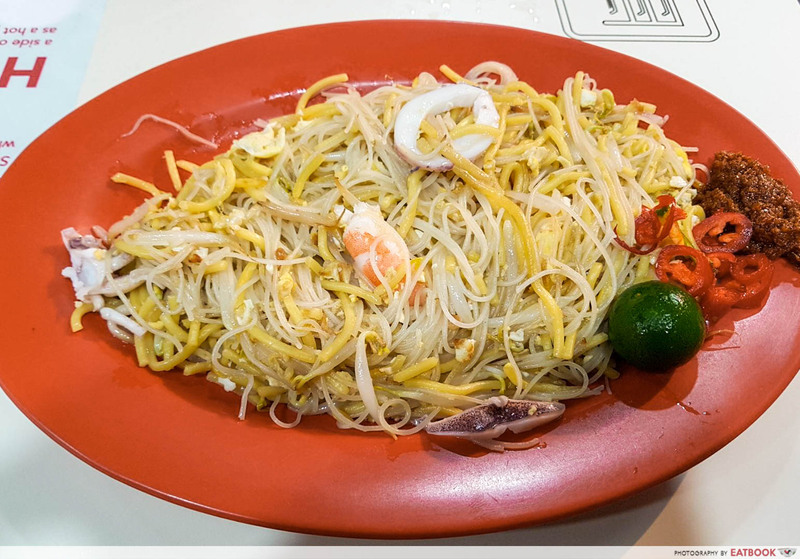 His Fried Hokkien Mee ($3/4/5) has earned itself a large following of loyal customers over its many years of operation. What makes the dish stand out is that although the noodles are drier than the average plate of hae mee, it still manages to be so rich in flavour. This is probably because the noodles have already become saturated with prawn gravy, making them delightfully savoury. If you’re searching for something palatable yet not too filling, stop by Chomp Chomp Rojak•Popiah for a plate of Popiah ($4) and Rojak ($3/4/5). The rojak contains a variety of fruits and vegetables mixed in a sweet, black sauce, and blanketed by a thin layer of roasted peanuts. Meanwhile, the skin of the popiah is soft and perfectly complements its fresh, crunchy contents which include vegetables, egg and prawn paste. The stall also sells Kueh Pie Tee ($3.50), which substitutes popiah skin for hard, golden-brown cups. If you’re looking for an equally tasty alternative to the usual hand-rolled popiah, you might want to order this instead. 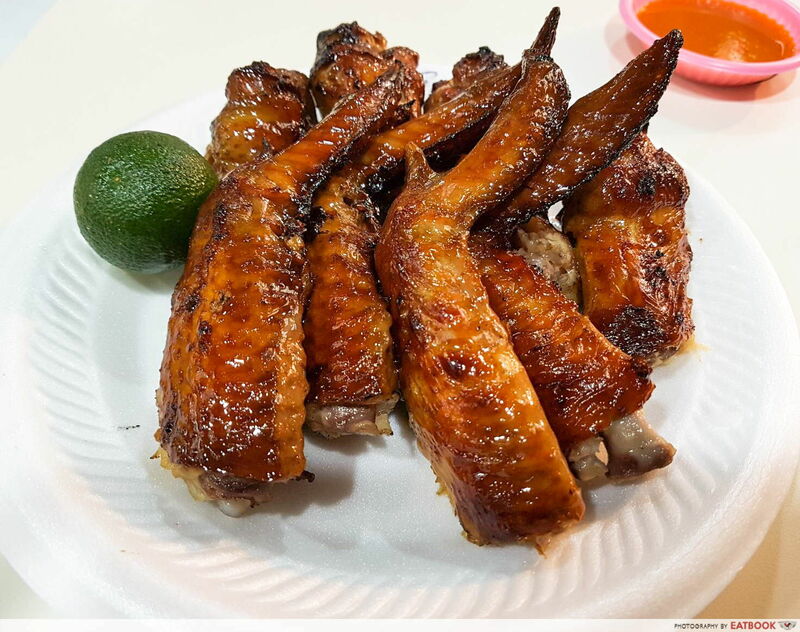 Chicken wings are practically a staple food at Chomp Chomp Food Centre. Here at Chong Pang Huat, one piece of chicken wing costs $1.30, with a minimum purchase of two pieces. The skin of the wings are consistently crispy and delicious, with little fat underneath so you needn’t worry too much about that diet you’ve been trying to watch. Even the flesh is well-marinated and tasty. Don’t forget to squeeze the accompanying lime all over your wings and drumsticks to truly enjoy the chicken at its best. Another famous local delight which you can’t miss out on at Chomp Chomp Food Centre is char kway teow, particularly this one from Chomp Chomp Fried Kway Teow Mee! The Char Kway Teow ($3) is accompanied by a satisfying amount of cockles and bean sprouts, and the noodles are sufficiently moist. The eggs are also well-cooked, crisp, and dense with sweet sauce. Do expect the stall to be rather crowded with customers during varying periods of the evening. As Hokkien mee and char kway teow go hand in hand, I sure hope you don’t miss out on this one! At Satay Bee Hoon•Hainan Beef Noodle, a plate of Satay Bee Hoon can be considered an alternative to actual satay on a stick, because of the hot peanut sauce drenching the bee hoon, accompanied by tau pok, prawns, pork, cuttlefish, and vegetables. The aforementioned ingredients are also fresh and juicy. 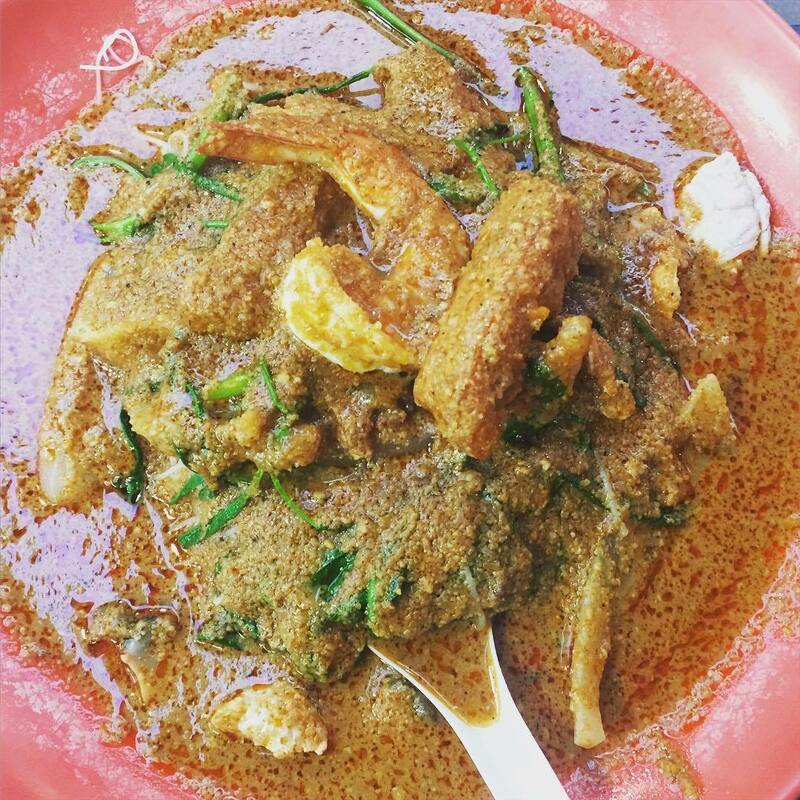 If you’re a fan of dipping your satay in peanut sauce, this dish is a must-try for sure. Prices here range from $4 to $10 depending on portion size. 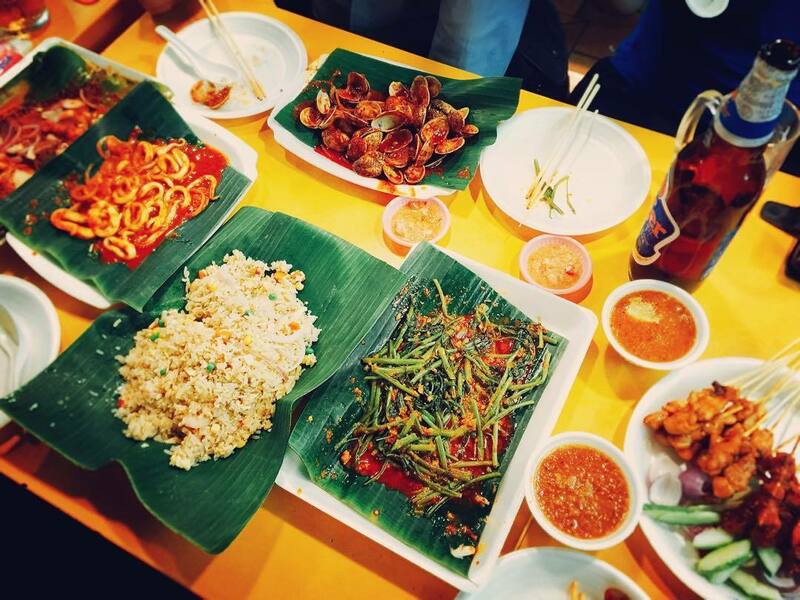 If you’re dining with a large group of friends, Hai Wei Yuan BBQ offers a large range of scrumptious dishes. Situated conveniently at the entrance of the food centre, this stall is known for its Sambal Lala Clams ($8) and BBQ Stingray ($12). 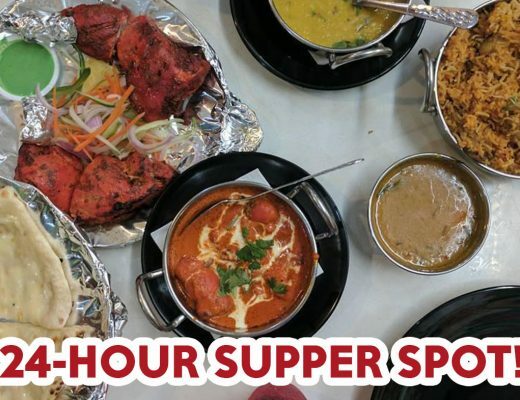 Both dishes contain the perfect combination of spice and seasoning. The lime and cincalok accompanying the stingray really help add that extra zing to the dish. 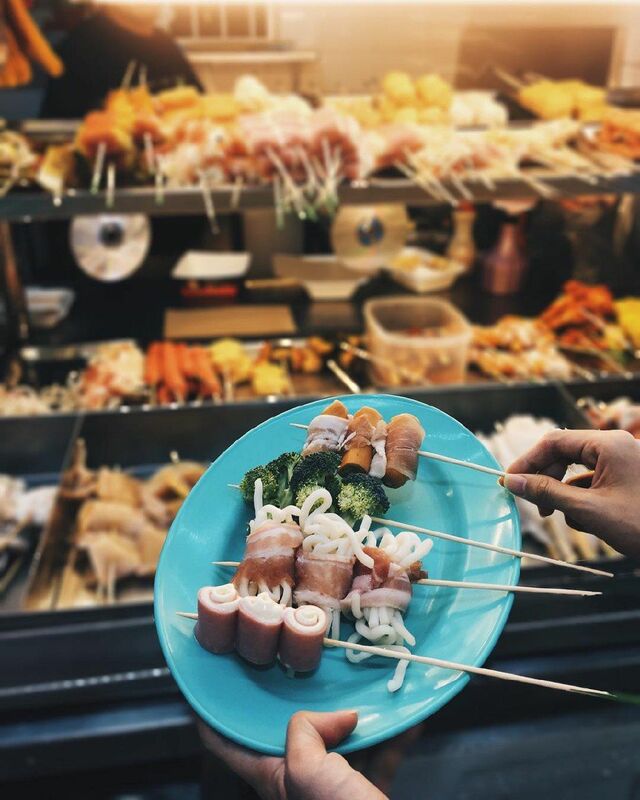 At the aesthetically designed lok lok stall, Wang BBQ and Grill, be spoiled for choice by the vast selection of over 50 skewered food items, including fried wonton skin with bak kwa, mini crabs and sea urchins! Price per skewer ranges from $1.20 to $2. However, do note that a minimum of seven skewers are required per order. The skewers are all nicely marinated in a secret, smoky brown sauce. You will also be offered three different dips – Thai Sweet Chilli, Sesame, and Sambal Chilli – to help make the food even more shiok! Carrot cake is right up there with Hokkien mee on my list of favourite local dishes-slash-comfort food. Initially, I planned to patronise Stall 36’s carrot cake, but was persuaded by my father to try his go-to stall instead: Ang Mo Kio 409 Fried Carrot Cake. I was skeptical, but fortunately, I am glad to say I wasn’t disappointed. We opted for White Carrot Cake($3/4/5), and were delighted to find that even without the sweet sauce added to black carrot cake, the dish was still very flavourful and moist. Mixing chilli into the dish also helped to further enhance its taste. 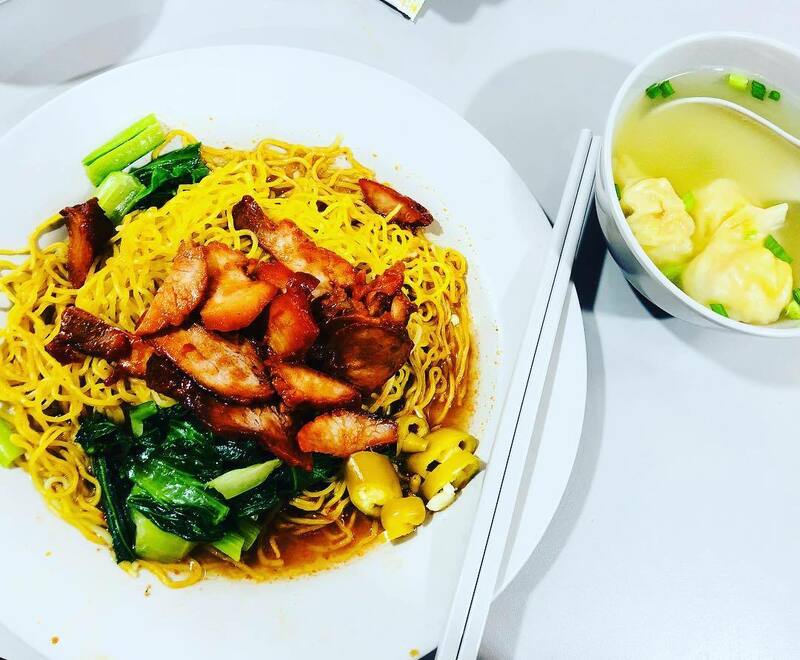 If you’re searching for something less greasy amidst all the barbecued dishes and fried food in Chomp Chomp Food Centre, I’d point you in the direction of Swee Heng Wanton Noodle for sure. A plate of Wanton Noodles ($4) here contains fresh, leafy vegetables and chewy, yellow egg noodles tossed in a spicy tomato sauce, and topped with thick slices of juicy char siew meat. In addition, each plate of noodles comes with a bowl of boiled wonton soup. If you’re willing to take your meal a notch healthier, you can opt for their green spinach noodles instead, at the same price of $4. After all the eating you will be doing, you might be feeling more than a little bit thirsty. Out of the multiple drink stalls selling sugarcane juice, Ding Hao stood out the most to me. 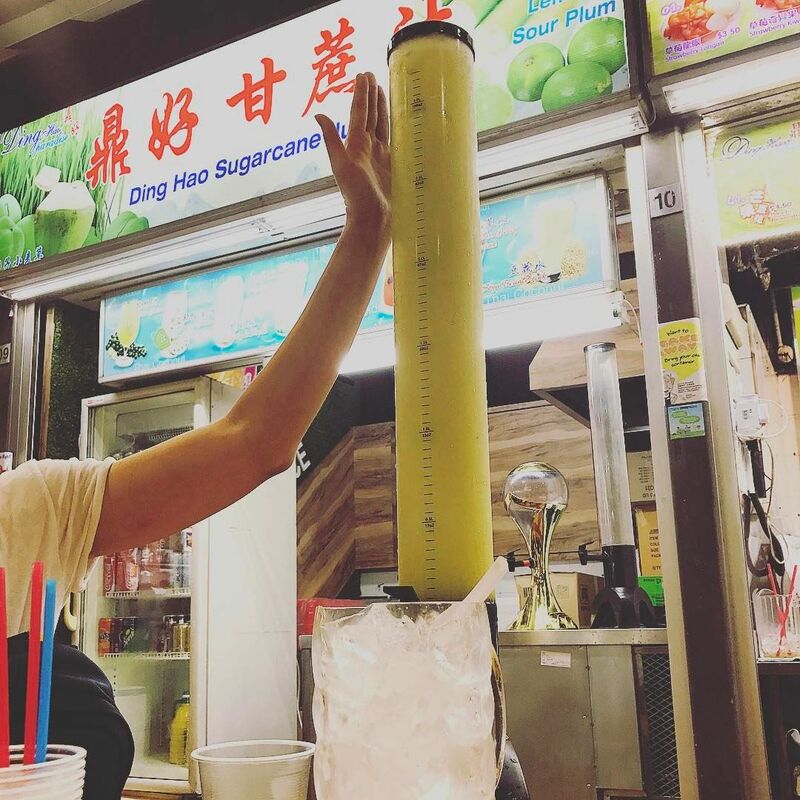 Apart from its eye-catching Three-Litre Tall Sugarcane Juice Tower ($15), I noticed that the stall occupied two units, with one unit selling only sugarcane juice, and the other selling fresh fruit juices, such as coconut juice and my all-time favourite avocado juice. Unable to resist, I ordered a cup of Avocado Juice ($4). Instead of being diluted and having a watery texture, the drink was thick and smooth. It also comes with gula melaka, which you can stir into your drink. However, next time, I think I would prefer my drink without any added sweetener, as I find the avocado juice flavourful enough on its own. 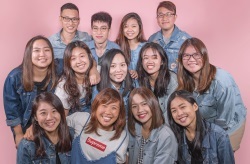 Grab your friends and head to Chomp Chomp Food Centre! 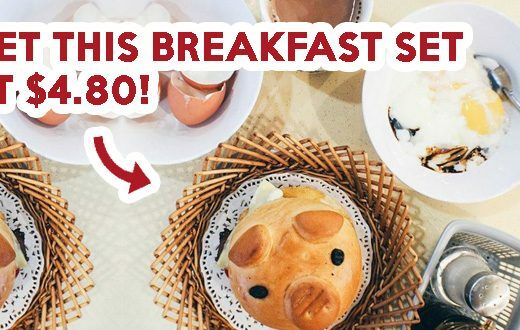 Mark a date on that calendar to catch up with your pals at Chomp Chomp Food Centre! Try to gather as many friends as you can, since the larger the group, the more the food. Oh and one last thing – remember to prep your tummy in advance by arriving on an empty stomach! 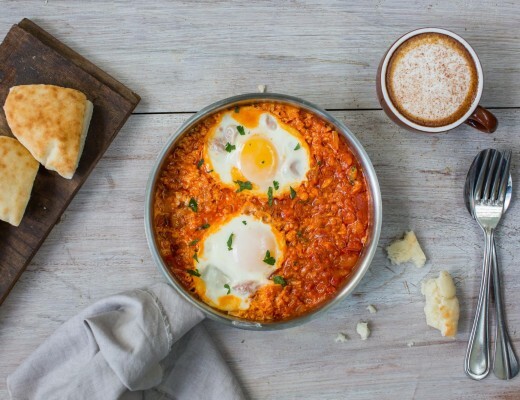 For those of you curious about other food locations in Serangoon, check out these Serangoon Gardens food stalls or this compilation of contemporary, chic Serangoon cafes!